Instagram is known as the consensus favorite app by photographers in today's age, but even with its name implying posting photos instantly, it's still a pain sometimes to post photos on-the-go at times. For Part Three of my Instagram series, I'll be sharing the absolute fastest method any user can adopt to spend less time posting Instagram photos and more time shooting! Hashtags: "Yes We Know Nick"
Alright, alright. I know I'm not going to spend too much time explaining on what hashtags are; because we spent more than enough time explaining what the right hashtags are in Part 1, and went through a in-depth hashtag guide in Part 2. But hashtags are essentially one pipeline where you can "advertise" your work to users as they search specific hashtags. So with that said, it is crucial to use hashtags if you're looking to grow your following, get featured, or simply get your work out there. 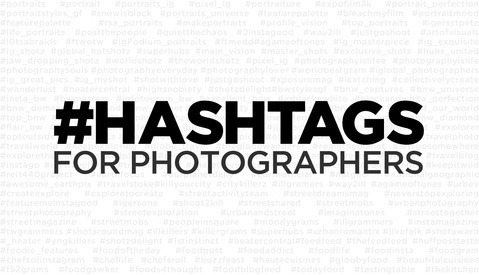 So without further ado, let's go through the slow, fast, and fastest way to post your hashtags on Instagram. So you can post any photo fast and on-the-fly! The original way to enter hashtags, and also the slowest. Entering each hashtag individually can be time consuming, especially if you're reaching the maxiumum of 30 hashtags threshold. Not to mention you have to remember them. I don't remember the last time I used this manual method of entering hashtags and don't recommend it if you're looking save time. So you have an idea of what your go-to hashtags are but you don't want to waste your time typing them in manually or having to remember them every single time? Great! This is a good method for you to learn. 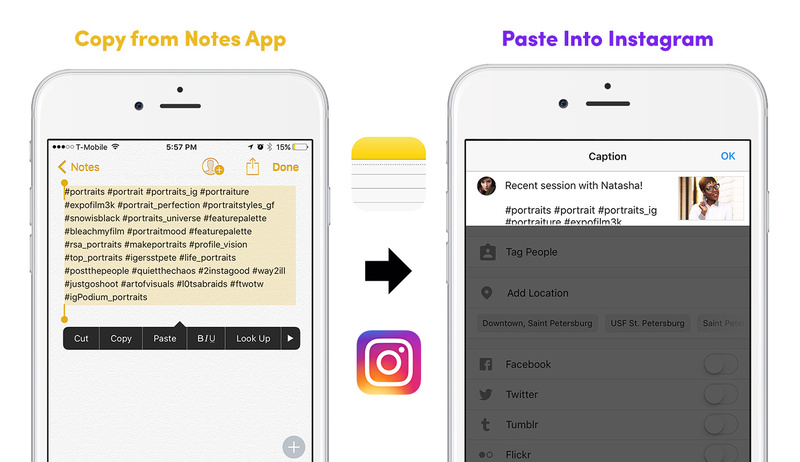 What you do is open the Apple Notes app and/or the equivelent of Andriod's note taking app (sorry Andriod users), and jot down your favorite hashtags. 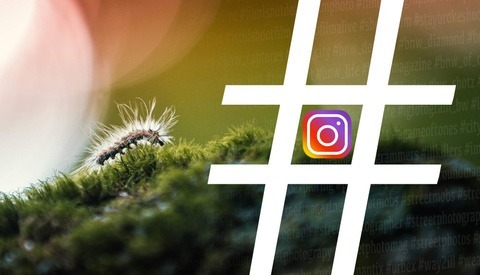 Whenever you're looking to post on Instagram: just refer back to you notes, copy the selected hashtags, open Instagram, and paste them into your description. Follow this path: Open the "Settings" > "General" > "Keyboard" > "Text Replacements"
Open Instagram and start a post, enter your caption then start to write your shortcut word. You should see an auto-fill bubble appear, simply click your space bar to enter. And your done! Seems a little complicated at first but it isn't at all and will save you much more time when posting photos on-the-go. With this tip you can create a list of fast shortcut words catered to a specific photo. 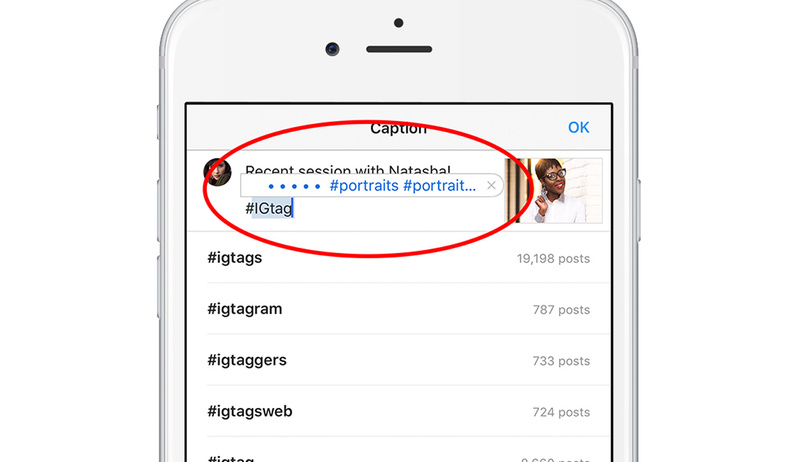 For example, you may have a set of portrait hashtags by setting up an "IGportrait" word shortcut, but you can also have a completely different list of hashtags setup for your wedding photos by creating a "IGwedding" list in your phone's text replacement settings. 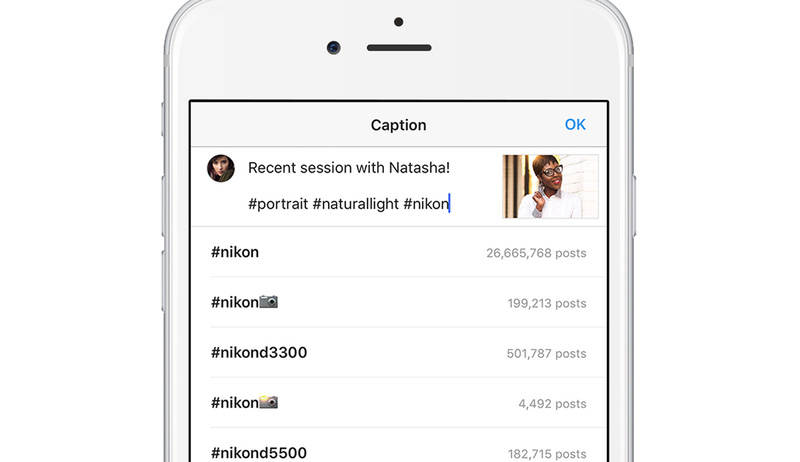 This eliminates the need to open a separate app, copy hashtags, re-open your Instagram, and... you get the idea. This trick allows you get in, get out, and spend more time shooting! That concludes the three part Instagram series showing the best tips I've could come up based on experience and real-life results. I hope you guys enjoyed this series, if you guys have any feedback or questions, feel free to comment below, email me, or leave a comment on my Instagram page. Make sure to subscribe to my YouTube channel so you to catch my videos before anyone else! Until next time, see ya! pretty slick! thanks for sharing. Amazing tip! Thanks a lot! I use an App called TagsForLikes Pro. You can use already made tags...or you can make your own lists of tags. Thanks for the tip. I use an Android, so I do the copy and paste method. No more kicking myself for forgetting a hashtag. It makes things much easier. copy and past has been working great, but im all for trying some new, if simpler methods. Would your image still show up on the results if you post the hashtags in the comments? Also, if anyone knows how to do this on android keyboard let me know ;-) Google wasn't helpful sorry. I just email myself the tags so I can use my computer - that thing that Instagram apparently doesn't want us to use. I still find their whole model ridiculous. No built-in reposting, no computer posting, and must have a Facebook business page for a commercial account. At least they relented on square photos, so perhaps there's still hope. Great 3-part article. Already seen some better results on my last post and was more than excited not to have to type out all the hashtags everytime! Since I am disabled and only have the use of my left hand I use a word document I made on my computer and copy and paste the hasgtags. This way may be faster though! Thanks for the tip! Is it best to stay consistent when using hashtags or better to switch them up every now and then? Glad you found this helpful! I'd switch them up and experiment, especially if posting different genre of photos. Lightroom's IG plugin lets you use your computer to type hashtags while posting your photo direct from LR. You have similar options of text replacement as Nick mentions here. Great tip. Thanks, Nick. Ooh, I will have to look for that plugin also. Thanks! 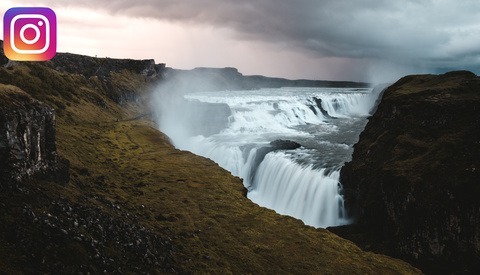 Awesome post - will be trying - thanks for sharing! Great Job! It seems that our world has so many deeply complicated "user friendly apps" its hard to be efficient in few. Thus the ever useful slogan fits "Jack of all Trades and Master of NONE". Thank for your article!